If your husband would rather spend his holiday hiking through the Outback than reading on the beach, it makes sense to celebrate his love of all things adventure with gifts that make getting outdoors easier than ever. The usual tie and cologne combo won’t work for this guy – it’s got to be a gift that’s genuinely useful. Luckily, there are plenty of cool gadgets and gifts out there that will suit your man perfectly. 1. Sharpen up. Every outdoor lover needs a great pocketknife ready to help them out of any sticky situation. There are plenty of options out there, but it’s best to stick with the experts when it comes to something as important as a hunting knife or Swiss army knife. Victorinox knives have been a tried and tested solution for outdoorsy men for decades, and your husband will definitely appreciate having one of their top-notch products in his pocket. 2. Snap a shot. The best adventures need to be captured and recorded as keepsakes. Give your husband a high-tech new GoPro so he can record all of the beautiful sights he sees, and you can keep up to date with his adventures without always having to tag along. 3. Get a boot upgrade. Comfortable, sturdy hiking boots are an absolute must-have if your guy likes to trek through the great outdoors. Replace his rugged old pair with a waterproof, thick-soled new set of boots so he can hike to his heart’s content. 4. Jazz up his camping cooking tools. If your husband is still cooking over the campfire with ancient tin pots, there could be a good gift opportunity in the form of snazzy new crockery. Plenty of camping stores offer good quality sets of cooking sets that will withstand plenty of knocks without losing their shine. 5. Make his campout more comfortable. Camping always involves an element of roughing it, but that doesn’t mean your man has to suffer through a terrible night’s sleep while he’s exploring nature. Buy him an insulated camping pad to put underneath his sleeping bag in his tent so he can rest comfortably after a long day hiking through the bush. 6. Warm him up with a high-quality thermos. You don’t have to go without an energising cup of coffee in the morning when you’re hiking or camping. Get your guy a warming thermos with a large capacity so he can sip on his favourite hot drink by the campfire or carry it in his backpack while he treks. 7. Set him up with a compact tent. Tents can be a serious hassle even for experienced campers and adventurers. Old-fashioned tents take ages to set up and take up far too much space in a rucksack. Help him out with a lightweight, compact new tent that he can carry with him wherever he goes. 8. Keep him charged up. 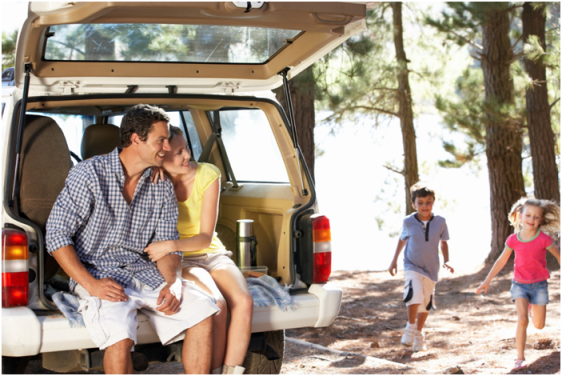 If your husband frequently goes on camping trips, it’s important that he’s still able to stay in touch with you at home in case of emergencies or important conversations. Keep his phone charged up throughout the trip with a portable solar charger. They use the sun’s rays to channel energy into your mobile devices, so he can stay connected through all his adventures.